Don’t forget to stop in and enter our Silhouette contest! You could win a Silhouette CAMEO and rhinestone kit! Hi there! I’m Alicia of Mayfly and I’m thrilled to be joining in again this year at Craft Camp! 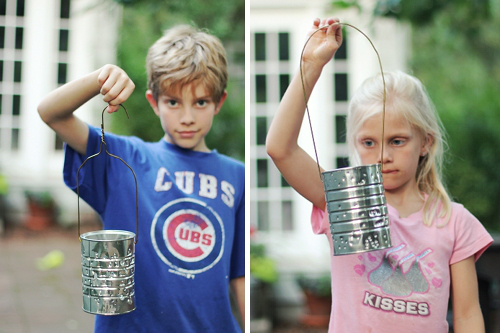 My kids and and I made super simple tin-can lanterns that my mom made with my sister and I when we were little. We used to take them on camping trips. They are so easy and fast, and they are really stunning after dark. 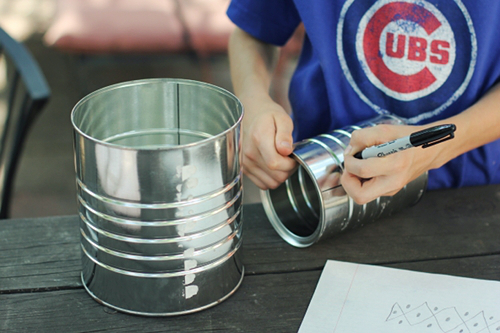 1. a few empty tin cans- we used coffee cans. First, draw your design on paper if desired. Both of my kids sketched just a little bit first before they got started with their cans. I think it made them more sure of themselves before they started with the sharpies. 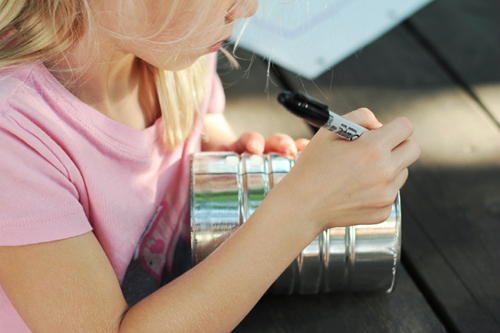 Then draw your design in dots on the can in sharpie. 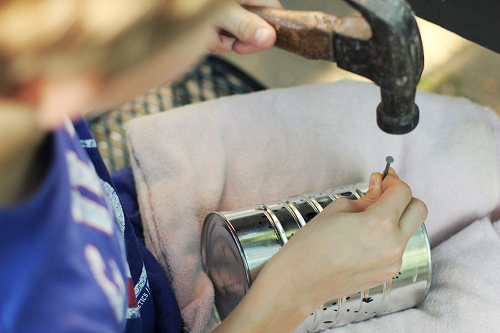 Next find the most comfortable way to hammer the nails into the can to poke the holes. My son (11) tried at first laying the towel and can in his lap. This worked for awhile, but after a bit he moved it all up to the table. My daughter (7) hammered a few, but was nervous about it, so I ended up poking most of her holes for her. My husband Brian, came out with his cordless drill and sped this step up considerably, but really, it wasn’t necessary to get so high-tech. 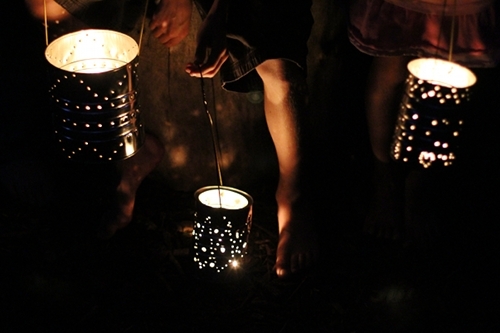 Remember the more holes you poke, the more dramatic the lanterns will be. My son’s can was a little thinner than the others and got a little “bendy.” He was concerned, but I assured him it wouldn’t matter, and it would look just as good as soon as it was dark. And I was right. But I do remember when we were little, filling the cans with water and freezing them the night before to solve the bending issue. I should have done that this time- oops. After you think you’ve poked enough holes, it’s time to attach your handles. Clip your hangers and bend them into long loops. 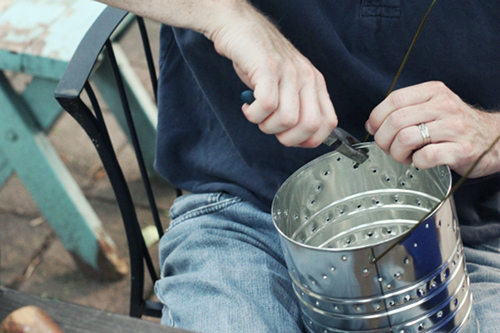 Hook the ends through holes in the cans and crimp them into hooks with your pliers. 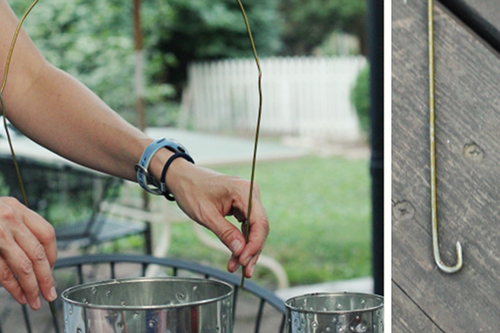 Be sure to make the handles long enough that the heat from the candles doesn’t burn little hands! Thanks for letting us join in on all the Craft Camp fun, Cindy! However, with the 520,277 applications of which designers registered having USPTO really, chances are that even if it's just fifty percent are going to be of course patents, and also lv bags on sale considerably much less will end up professional achievements [source: USPTO]. For each innovative gadget of which becomes a home brand plus changes us, there are millions of other people lv bags on sale that will languish inside obvious lv bags on sale place of work data files, unappreciated other than probably since curiosities. If you fill the cans with water and freeze it before you start, you can poke all the holes you want through the can and into the ice. Your cans will not get "bendy." Just work on a towel and when you're finished let the ice melt completely. Drain the water and you'll have a perfect can lantern. If you fill the cans with water and freeze it before you start, you can poke all the holes you want through the can and into the ice. Your cans will not get "bendy." Just work on a towel and let the ice melt completely. Drain the water and you'll have a perfect can lantern. Just love this... We do childrens workshops and I think the kids will love these. They can sit outside and admire the glow! We say "let your creative side shine"
How cool, so imaginative. Thanks for the good ideas. It's winter in Brazil now and I'll try it next summer. The look great. I will put on my list of things to try this summer. I remember seeing years ago about filling the cans with water and freezing them before hammering the holes - I guess it's suppose to make it easier, not sure if it would be or not. Those are beautiful. I like all the photo's too. I can't believe how beautiful something so simple can turn out. These look gorgeous lit up at night. This was a brilliant tutorial. 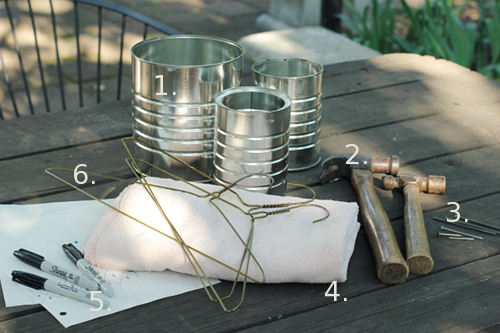 I made some of these for my rustic college graduation party, and I did not use such simple steps. I also hung mine with twine, but I LOVE the idea of using the wire hangers! Such a neat idea! 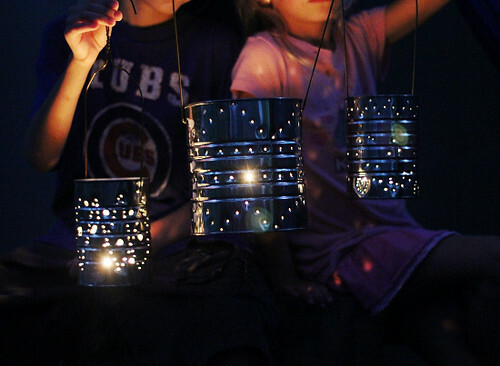 I think solar lights or even the tap lights from the dollar store would work well for kids, too. We'll be making these for sure! Love these! They look like fireflies at night! We just put backyard camping on our to do list for summer! What a perfect craft to get ready!! I can't wait to see my boys faces when I hand them the hammer and nails!! They will be thrilled!